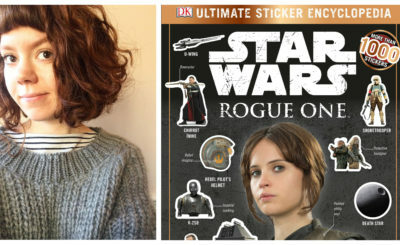 Sadie Smith is the Managing Editor at DK Licensing for movies and comics. She answered a few questions via email for this interview. My dad started taking me to the movies at a very young age and in 1977, off we trotted to see this new sci-fi movie called Star Wars. At the tender age of 6 years old, I do remember being skeptical as to whether this was my kind of film (yes, I had already developed my own taste by that point). I was captivated throughout – and at times a little scared, but in that good way, you know, when you hide your eyes behind your hands but peep out from between your fingers kind-of-scared? I don’t think I even finished my popcorn…I left the movie theatre goggle eyed and in awe of the story and the characters and creatures I had just been introduced to. It left me wanting to know more about this weird and wonderful universe. When I was very small, it was Chewbacca all the way. Hairy like a bear, brave and loyal – what’s not to like? But, as I grew up with the trilogy, Leia became my firm favourite. It was rare back then to see a female hero like Leia in the movies – a woman who could rescue herself and lead a rebellion. This inspired me as a little girl to see all possibilities of being, not just the boxes that the ‘70s and ‘80s wanted to put me in. I have not once in my life ever felt I needed rescuing by a man and Leia played a big part in that. How long have you been with DK and what was your path to getting your current position there? I have been at DK since the dawn of time. Well, okay, coming up for 20 years now. In my early 20s I had various roles at other publishing houses, all creating illustrated reference books. I was always interested in working on illustrated books, as I love working with photography and illustrations. The pinnacle for me was always landing a role at DK, as they were (and still are) the best at producing gorgeous and innovative reference books. At 27 years old, I finally got the position I had been longing for at DK, and started out as an editor in the children’s reference team. I moved around the company a bit, also working on Travel Guides for a while, but I missed working on children’s books. So, when the chance to move to the DK Licensing team came up I grabbed it with both hands, as I knew that they produced the best Star Wars books in the business and it would be a real nostalgia-fest for me! I started as a Senior Editor and then moved up to Managing Editor 6 years ago. Can you explain what you do in your role as Managing Editor and what a typical day (if you have them!) might look like? The role of a Managing Editor is incredibly varied. But, I would say that my primary role is to support the editors in the team and to help them to do their job. I manage the scheduling and budgeting of our list of titles, and read through the pages as and when they are designed and edited, to ensure that they are age-appropriate and on brand, both in terms of DK and the franchise we are working with. I look out for possible new writers, and advise the team on who I think could be right for the projects they have coming up (and ask them for their suggestions too.) I plan the whole list of books a year in advance in terms of who will be editing what, trying very carefully to play to individuals’ areas of interest and strengths – and not to overload them. That is the interesting stuff. Besides this, there is a whole load of admin, but I do love being an organiser so that’s all good. I just feel so lucky to work with such a talented, creative team on fun, successful brands. How many projects are you usually working on at the same time? 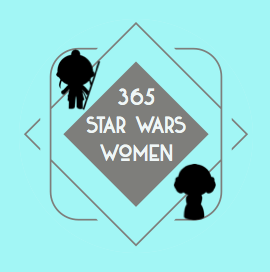 Are most of your projects Star Wars related or are they just one of many categories of books you work on for DK? I manage a list of around 25-30 books a year. I would say that the list is pretty evenly split between Star Wars, Marvel Comics, DC Comics and Disney titles. We create both adult and children’s reference books in the team. 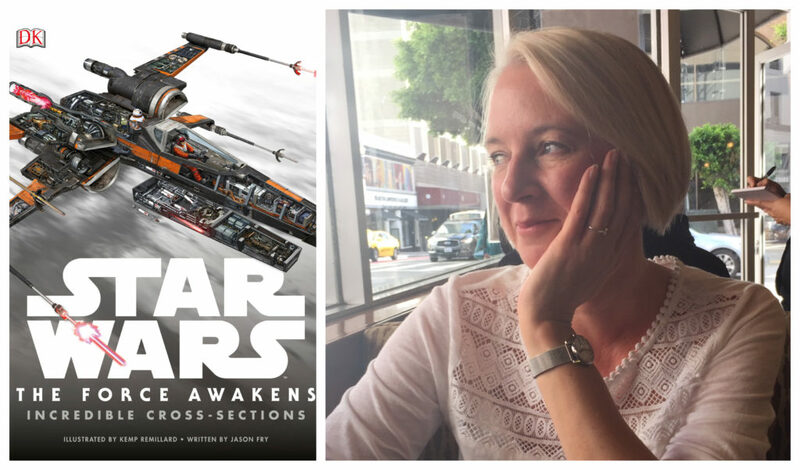 You have worked on many of the most widely known and beloved Star Wars reference books – the Visual Dictionaries. How far in advance of a feature film release date does the work on a Visual Dictionary begin? Are a smaller number of people involved in the production of these books since they are filled with secret information? We usually start work on the movie tie-in Visual Dictionaries around 9 months ahead of publication – but that’s 6 months actual creation time, as the book has to be delivered to the printer 3 months ahead of publication, to allow time for printing, binding, and shipping. Six months sounds like a long time, but really it isn’t for such an intricate book with so much photography. And of course, everything we do has to be verified and approved by Lucasfilm, and that takes time, too. We are very lucky to work with Lucasfilm’s story-group genius Pablo Hidalgo on the Visual Dictionaries – not only is he a very talented writer, he is an ‘inside man’ and brings so much rich storytelling to our books. Star Wars: The Visual Encyclopedia and Star Wars: Absolutely Everything You Need to Know are such fun and unique books. Do you have a favorite spread or entry from each book and can you share anything (inspirations or challenges) about the making of those books? These are two of my favorite books. Star Wars: The Visual Encyclopedia was such an ambitious project in terms of the number of images and the organisation that went into it. But it is the kind of book that DK does really well. 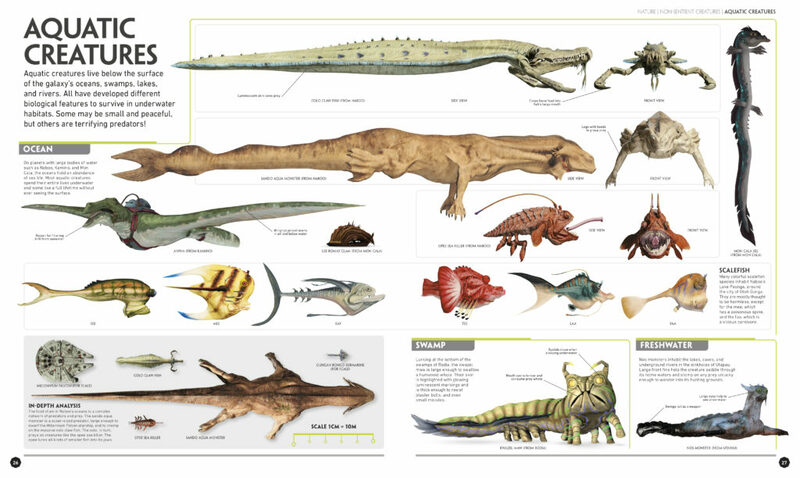 My favorite spread (but hard to choose, as I have so many) has to be Aquatic Creatures. To see them all laid out like this, as they would be in a natural history book, is brilliant. From Star Wars: The Visual Encyclopedia. Star Wars: Absolutely Everything You Need to Know is a really fun book, with so much packed in it! This was a challenging one, in terms of design, as every spread is different. The writers did such an amazing job researching all the facts and stats for this book; it is so informative and so funny at the same time. 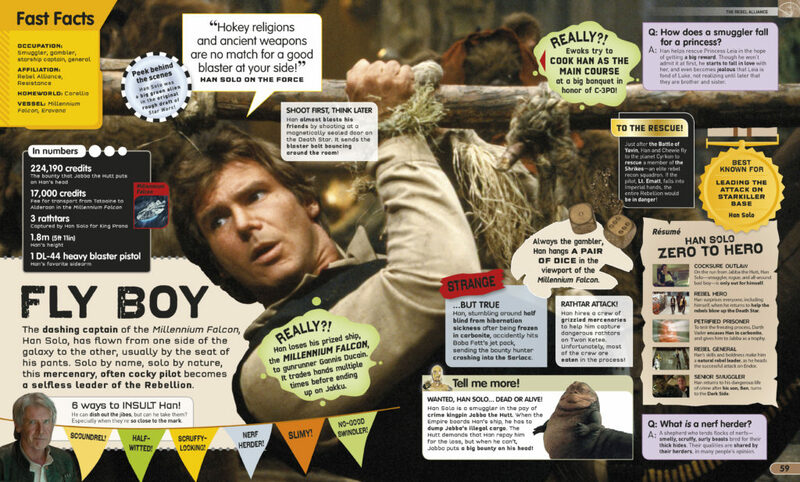 I love the Han Solo spread, especially the visual presentation of “6 ways to insult Han” – the insults are laid out on festive bunting! One of my favorite Star Wars books in my collection is Star Wars Year by Year: A Visual History. I know this book has been updated several times – is it safe to say that this book will have another update in years to come? Oh yes! It is one of DK’s favorites too. It is such a fascinating take on the phenomena of Star War, and so interesting to see what else was going on in the world of popular culture (and the wider world) at the time when the Star Wars franchise had just begun, right up to the present day. I am sure we will update it many more times in years to come! I saw that you wrote the Level 2 Reader Star Wars Rebels: Meet the Rebels. I’m curious what other Star Wars or non-Star Wars books you have written and if you think it helps you in your current role at DK to wear the hat of an author from time to time. 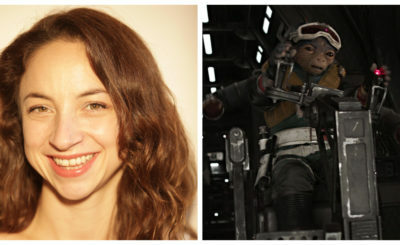 Will you be at Star Wars Celebration Chicago? 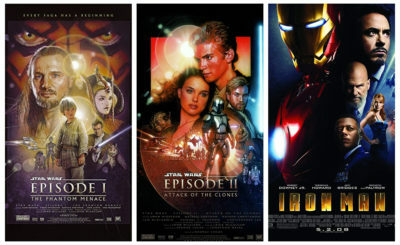 Have you had the chance to interact with Star Wars fans much over the years? Unfortunately I won’t be at Celebration this year, but I have been in the past. I attended Celebration Anaheim in 2015 – and this was a special one, as it was the year that The Force Awakens came out. The level of excitement at this event was enormous! I really enjoyed working on the DK stand and getting to meet the fans, both of the movies and our books. Star Wars fans are the best – warm, friendly, and totally passionate about Star Wars. It was really useful to get first-hand feedback on our books from the fans too – and ideas on what they would like to see us do next. I also worked the stand at Star Wars Celebration London 2017 – it was wonderful to see this amazing event come to my home city, and to get the chance to chat to people about our Star Wars books again. I actually get to interact with Star Wars fans every single day, as the DK office is full of them! Can you share any news about upcoming Star Wars books from DK or other projects from DK you are excited about?